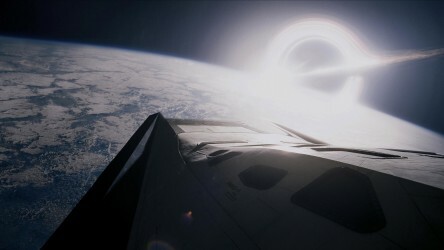 The film is based on a novel of the same name, written by Andy Weir in his spare time as a computer programmer. Weir thought he had written a story only for science enthusiasts like himself, but the intriguing premise and humour in the book caused it to become more popular. A film adaptation was inevitable, and screenwriter/director Drew Goddard was hired to write a script, in close consultation with Weir. The Martian is directed by legendary British director Sir Ridley Scott, who is well-versed in the science-fiction genre, through iconic titles like Alien and Blade Runner, both of which have been hugely influential for other filmmakers. Whereas some sci-fi tends to date over time, these films remain extremely popular with audiences. When Scott announced he was returning to sci-fi, expectations were understandably sky high. From A Trip to the Moon in 1902 to the more recent Guardians of the Galaxy, via Stanley Kubrick's seminal 2001: A Space Odyssey, there have been countless wonderful films set in space, each representing vast, awesome landscapes in ways that capture people's imagination. Recently, Gravity and Interstellar have brought space back to the big screen in a huge way, both using technological advances to help tell their stories in fresh, inspiring ways. On a smaller scale, British director Duncan Jones managed to make a small budget go a long way in his cult film Moon. Mars itself has fared less well on the big screen, with big budget films like Red Planet, John Carter and Mission to Mars failing to connect with audiences and critics. Filmmakers have also used the possibility of Martians to make comical films about the planet, such as Mars Attacks! and animated comedy Mars Needs Moms, but it's fair to say that Mars was well overdue a great film being made about it. It was very important to the filmmakers that The Martian was scientifically accurate. For example, the process by which Watney attempts to create water on the planet is both highly amusing and scientifically plausible. Drew Goddard went so far as to describe the film as "a love letter to science". Filming largely took place in Jordan, as its red desert was the most useful stand-in for the famous look of the dusty planet. Crucially, the filmmakers made contact with NASA at a very early stage, working closely with their consultants to ensure that what we see on screen was as plausible as possible. NASA are understandably protective of their image and maintain strict controls over which films they work with, frowning on those that show a flippant attitude to their work. With The Martian, they saw the potential very early for promoting the concept of space exploration and raise public appetite for real expeditions to Mars. NASA were involved in every process, from how Watney might go about growing crops, to the look and design of the vehicles and spacesuits. The film even makes reference to actual NASA projects that are taking place. But inevitably, a certain amount of dramatic licence is also involved. A sandstorm such the one seen in the film would not actually take place on the red planet, and the film does not acknowledge gravitational differences as accurately as it could do. When designing the space suits, the costume designer looked at many actual NASA Mars suits and noted how bulky they were, resembling the look of Toy Story's Buzz Lightyear. Ridley Scott did not like this design, so although those in the film are based on actual suits, they are slightly different and allow for a greater ease of movement. NASA and the filmmakers both realised that these were only small inconsistencies that could be sacrificed to make the overall project work. Much of the film's early stages are taken up with Watney's attempts to create water in order to survive. By coincidence, in the week that the film was released, NASA announced that liquid water had in fact been found on Mars, a discovery that significantly increases the chances of some form of life eventually being found there. For the filmmakers, this was not only terrifically exciting, but provided an avenue of publicity they could not possibly have conceived of; the whole world talking about Mars just in time for their film's release! Look out for the significant role played by the Chinese space agency. The idea in the film is that international agencies should work together and combine their resources to aid scientific progress, but it is also an acknowledgement of the increasing importance of China to film studios. As the Chinese market becomes more opened up, more Hollywood films are released there (although still only a very limited number), and there is a huge appetite for their product amongst the vast population. One way to entice them is to feature more Chinese locations and characters on screen, an approach adopted by Iron Man 3 and Terminator Genisys, as well as The Martian. We can expect to see this trend continue increasing in future releases. 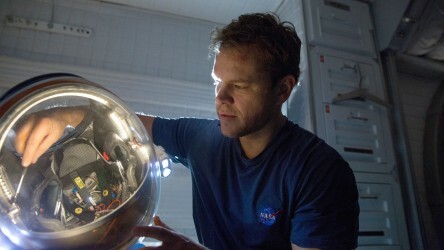 One of the challenges in production was dealing with the fact that Matt Damon would be on screen for large amounts of time, totally on his own. While in a novel this isn't a problem, a film would quickly become boring and incomprehensible if a character was by themselves and not communicating with anyone. One approach is to use voiceover, but this device can become lazy and boring. So, for The Martian, they chose to combine voiceover with scenes involving Mark addressing the GoPro cameras situated around the station in a manner similar to a captain's log. This allows for his humour and personality to come across, for the science to be explained in comprehensible ways, and for the reality of a man being left alone needing to communicate with someone (or something) to be addressed. 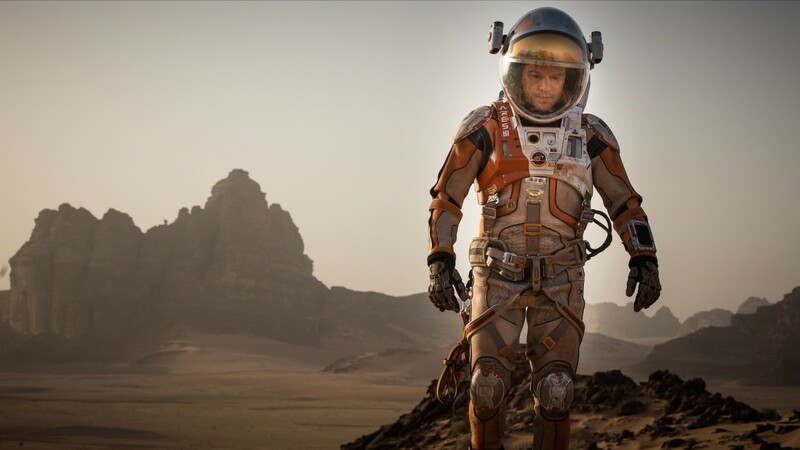 Really, The Martian is the latest in a long line of cinematic survival stories. Matt Damon and Ridley Scott were partly inspired by the mountaineering documentary Touching the Void. Tom Hanks famously made friends with a volleyball while stranded on a desert island in Cast Away, while 127 Hours and Gravity also feature characters marooned far away from the rest of civilisation. Those who have seen Saving Private Ryan and Interstellar will also be aware that this is the third time that Matt Damon himself has needed rescuing! But none of these films included the fabulous disco tunes heard in The Martian, which provide a distinctive soundtrack unlike that which we expect from science fiction film. Underneath it all, The Martian remains what Scott and Drew set out to create - a love letter to science - and it will surely inspire many young people to learn more about the world around them, as well as looking up to discover more about worlds further afield for many years to come. Explore the themes of space exploration further with our Into Film Recommends podcast below, or log in to SoundCloud to download the podcast and listen on the go. The Into Film Recommends Podcast Series is also available on iTunes. Joe has a BA in Film & American Studies from the University of East Anglia and an MA in Contemporary Cinema Cultures from King's College London. He has worked with the BFI London Film Festival and on the production of ITV documentary 56 Up. A film guide that looks at The Martian (2015), exploring its key topics and themes through informal discussion. Matthew Hall, Head of Media-ICT at Seven Kings High School, Ilford examines the depiction of masculinity in The Martian compared to that seen in Marvel's films. 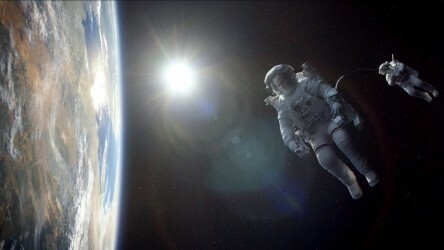 A collection of films taking in space exploration throughout cinema history. Into Film - Into Space is an ongoing project which provides a host of great free activities around the themes of space and exploration.